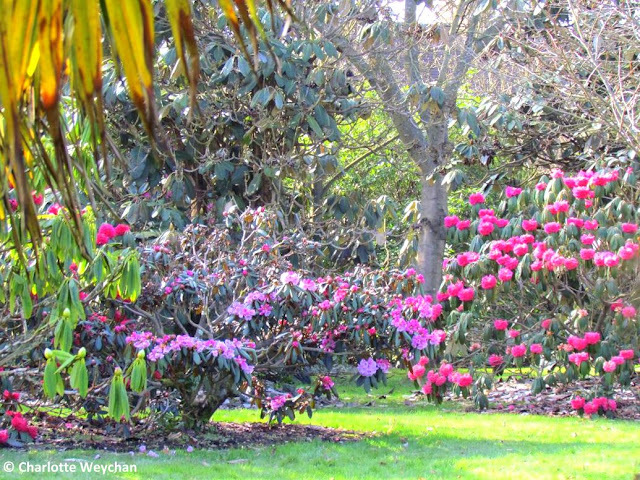 In search of Sussex spring gardens - stunning scenery and hellebore heaven! I'm back in the UK briefly before leaving for the US and have enjoyed two perfect sunny days and several gardens here in Sussex. I've been searching for spring bulb displays, but they're not yet in full bloom, so have made the most of what I've seen in the gardens I've visited in my short time here at home. 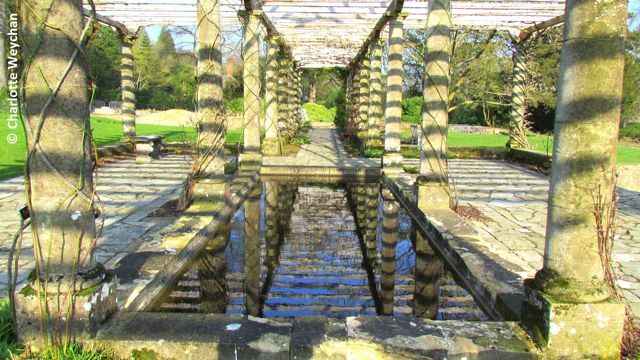 West Dean is looking absolutely glorious, with its wonderful Harold Peto pergola (above), currently laid bare, but has many bulbs beginning to show through the immaculately tended lawn areas. What I love best at this time of year, is the light - especially in the mornings and late afternoon - and visiting gardens at this time of year is sure to lift your spirits after the long, dark winter months! Sheffield Park is looking glorious too, with all the expanses of water and its network of bridges over the lakes (below) - the daffodils promise to bloom here in the next few weeks, although I won't be here to see them, but add it to your spring list and you won't be disappointed. Nymans is also coming into bloom and there were already many rhododendrons when I visited yesterday (below). The garden opens seven days a week this year, and promises to be quite spectacular, following the implementation of its "Conservation Plan", which has included new planting, and an emphasis on bulbs, which will soon be flowering. 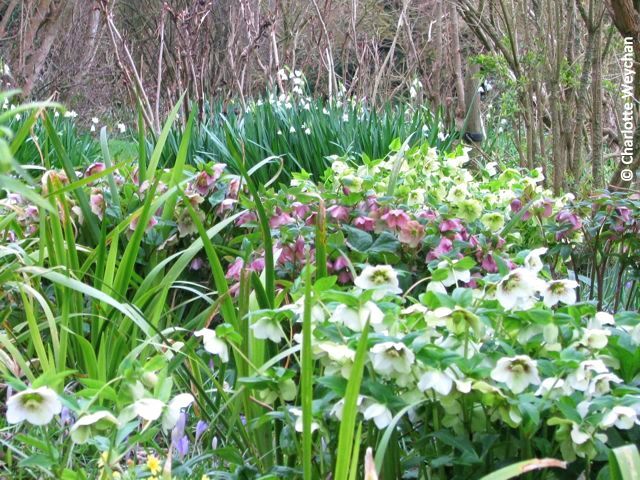 And for hellebore heaven, head to Highdown Gardens (below), where you will see further signs of spring in the daffodil lined approach to this charming secret garden, created by Sir Frederick Stern, and now maintained by the local council with the help of volunteers. Every time I return to this garden, I'm delighted by what I see! And it's a particularly rare treat these days, because it's free, but do spare a few pennies for the green donations post box if you visit, because it would be a sad day if this garden disappeared through lack of funding. That tree and all its long twisted branches is amazing! It is fabulous to see the gardens come alive after their winter slumber. Dear Charlotte, The light is glorious, but I have to say that my mouth flew open with sighs, when i saw your new header! 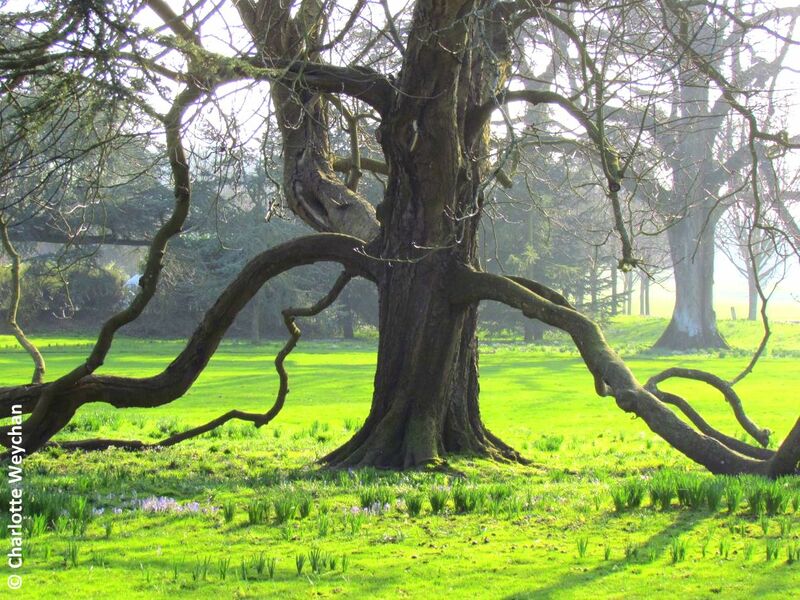 What a wonderful old tree! To stand beneath it, if one is allowed . . . watching for the little bulbs shoots, must be amazing. Beautiful gardens as well. Thank you for sharing! 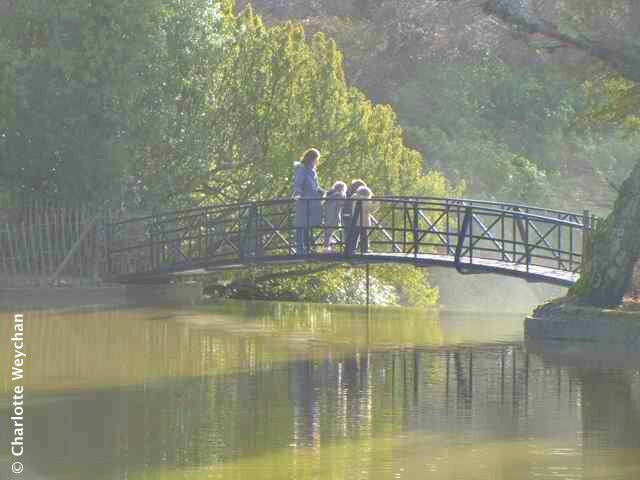 Hi Charlotte, Opened your Sheffield Park link, absolutely wonderful. I too was taken by the tree. What amazing form. Enjoyed the hellebores. Looking forward to your travels.